All of my friends left Baton Rouge after high school, so in college, I became an outlier for the first time in my life. I found solace in volunteering and reading. I helped international students learn English, and I was a “reading buddy” with students at a neighborhood school. My freshman year I read Crime and Punishment and wrote a five-page essay about the redemptive quality of love -- which were both assignments I gave myself. It was this connecting with others and larger ideas in the world that gave me the independence and sense of self to forge my own path. I didn’t know it at the time, but I was spiritually and emotionally leaving all of my reference points to journey in what the French philosopher, Michele Serres, calls the “blank middle” in his work, the Troubadour of Knowledge. Serres believed that the blank middle is where true growth occurs. Through that time in college, I saw a cycle begin to emerge in my life. I saw the power of doing things on my own, of believing in myself, of being the Little Red Hen who simply “will do it myself.” I had to rely on myself as I worked through the college process: I changed majors, from public relations to education, my junior year, and had to navigate that space; I had to resist the urge to “find a husband” to marry to achieve a social milestone that is very common in the south; I had to figure out next career steps without peers on my same trajectory. I started my career and my adult life with just myself, which might have added to my inherent perfectionism. But I also knew the power of finding support from like-minded individuals: my friends, even from their far away places, affirmed me for being me, and I understood that being an individual didn’t mean I had to be lonely. “The real passage occurs in the middle...the voyager is alone. One must cross in order to know solitude, which is signaled by the disappearance of all reference points” (Serres). I realized that both individuality and collaboration weave my journey. Twelve years after I first realized my journey in the blank middle, I still lead an individual educational existence. No one else teaches what I teach in my district: I travel between two schools to teach sixth, seventh, and eighth-grade literature and English language. For the first seven years of my career, I traveled to all seven schools in the district, and it was through these travels that I was able to cultivate relationships with staff, administration, and students. Though I still have no true “teaching partners,” I consider myself lucky to be a part of both schools -- yet I still feel like an outlier, forced to embrace Serres’s words: “No one really knows how to swim unless he has crossed a large and impetuous river or a rough straight, an arm of the sea, alone.” It has taken all of my independence and self-assuredness to be able to embrace the creative chaos that comes with teaching middle school, teaching in different schools, and teaching without having a partner who acts as a sounding board. To continue to build myself, I’ve participated in many professional development opportunities around the country. Leaving myself open to the serendipity that comes with the passage of the blank middle in an attempt to grow, I have cultivated relationships, never knowing exactly when the cycle of collaboration would weave its way back into my journey. I have had grants funded through Fund For Teachers and scholarships awarded through Colonial Williamsburg and in partnership with Holocaust Museum Houston. I joined a professional organization for women, Delta Kappa Gamma, and the fellowship, especially with retired teachers, is invaluable. The online communities from #passthescopeEDU, #LaEdChat, and #FlipgridFever, as well as the #OriginalsBookClub, all have been a gift, and I have connected with so many through shared stories. I never know whose journey will intersect with mine, and so I embrace as many as I can. Although I never left my hometown, I have journeyed through life in a solitary way: Serres writes, “But in the middle of the crossing, even the ground is missing; any sense of belonging, of support, is gone." Each iteration of my crossing the river has allowed me to find partner teachers in the ether, even though those partners don’t share my full teaching day with me. Locally, it’s been other teachers in my department, including Laura Grubb and Aimee’ Perrodin, who have given me the feedback and support that I imagine comes from a traditional partner teacher. When faced with the realities of my perfectionism and test scores, they listen and suggest resources. As my students continue to shine in National History Day and with The Upstander Brand, their EdCorps (Education Corporations, which allow entrepreneurship skills in the classroom), my local teaching partners celebrate my students’ success with me. Laura and Aimee’, along with two other local educational stars Gina Charlet and Wiley Brazier V, always support my students’ development as they support my development. As I continue to try to navigate my blank middle, my circle of collaboration continues to expand globally, too. Grant Knowles is an educator in Tennessee, and through the magic that is Twitter, we have realized how closely our educational philosophies align; we call this #margrant. Our students have held Skype sessions to discuss organizational structure that will support giving back to the community and have used Flipgrid to communicate about the importance of sharing ideas. We embrace the blank middle, both for ourselves and for our students, and we both seek to empower students to effect change in the world. I have also found partner teachers in Bronwyn Joyce and Marialice Curran. They are my tribe, and their strength and vision help support collaborative projects. Bronwyn’s Our Global Classroom Flipgrid has helped my students and me connect with the larger world. 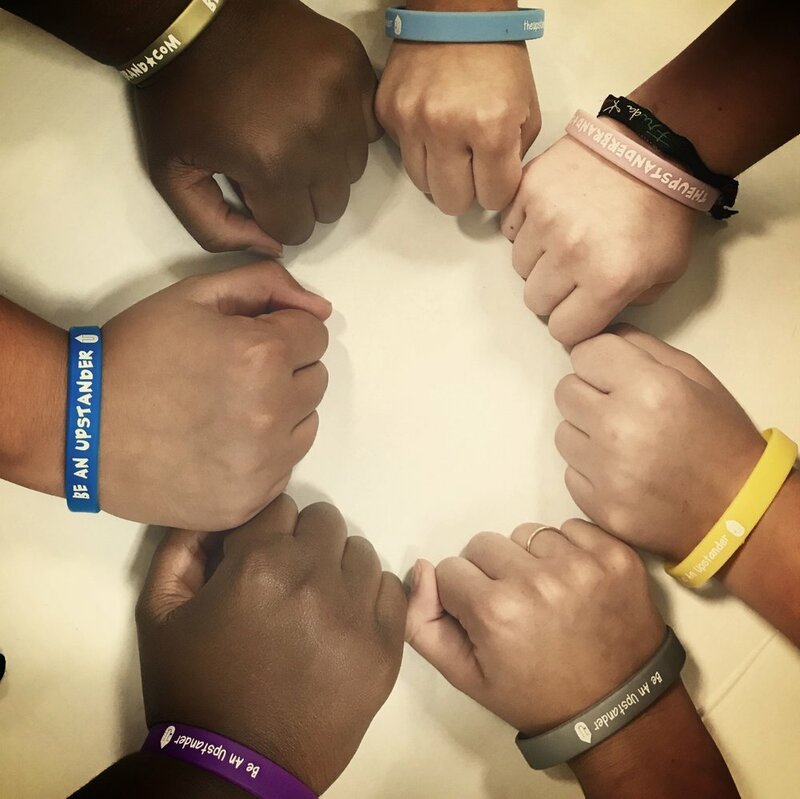 Marialice and her son, Curran, are models of what it means to be leaders for digital citizenship, and my students put this example into action through The Upstander Brand. My #SWU (strong women united) are my rock, my soul sisters, two individuals around the world who join me on my journey without having to be asked. I find affirmation in their experiences, and when faced with the demons that come with perfectionism, they are always ready to listen with an open heart. Since #SWU weaves independence and collaboration into my journey, creating a paradigm that continues to structure my journey, that means that it is open for all, and I know that #SWU will be a way for journeys to intersect all around the world. Serres again: “Whoever does not get moving learns nothing." As I move, I cycle back to collaboration through my independence: my circle widens and my connections deepen. Worlds come together to create synergy. My journey through the blank middle doesn’t mean that I am always comfortable or know what I am doing. I still struggle with perfectionism, and what education truly means. I still feel helpless as I cross the river that are standardized tests, and find reference points in that which is experiential learning. But ultimately, I embrace my individual existence and know that my cycles of collaboration will continue to build a world that is better for all who are journeying. Margret teaches 6-8 literature in Zachary, Louisiana, and through her work with Real World Scholars's EdCorps, National History Day, Teach Sustainable Development Goals (SDGs), and her students' EdCorps The Upstander Brand, she engages for student voice to effect change. Connect with Margret on Twitter @fmargret.